Anchor® Stencils from IPG® provide superior blast resistance, precise and intricate design capabilities, clean transfers, smooth and accurate tracking. See Anchor Sandblast Stencil flyer | Request a Quote here. 123 High quality, durable stencil construction coated with an advanced, rubber-based, medium tack, pressure-sensitive adhesive protected by a light blue poly liner. Designed for precision die cutting in roller and press machines. Unique rubber formula allows easy cutting with less wear on dies. The specially treated polyester liner maintains design alignment following plastic die removal. Recommended for single-process shaped carving of marble and granite. 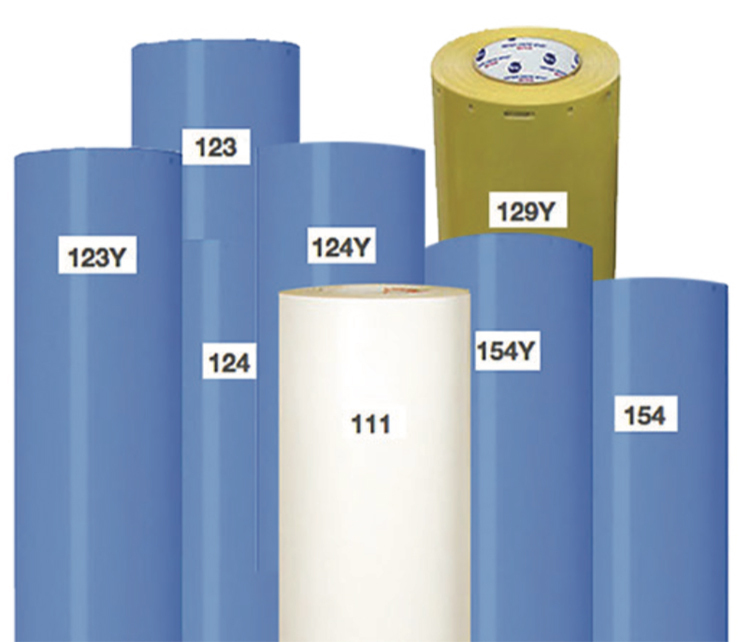 123Y Product has a yellow 2 mil poly film between adhesive and rubber to identify any residue remaining after sandblast; use with IPG/Anchor Filler #223. 124 Same construction as 123; a 2 mil polyester film holds letters and designs in place while transferring from computer to die; the holes are punched through the liner and rubber; use with IPG/Anchor filler #223. Note: 30” will work with large pin 30” plotters. 124Y This product has a yellow 2 mil polyester film between outside adhesive and rubber to help identify any residue remaining on substrate after sandblast; use with IPG/Anchor #223. 125 A high-tack stencil designed for sandblasting on raw wood and urethane foam board; easy-release light blue liner; the strength of the adhesive eliminates the need for filler or spray adhesives. CAUTION: This stencil has a very aggressive adhesive and is not recommended for use on some woods without first testing a sample piece; do not use on pre-painted, pretreated or glass surfaces. 129Y Designed for use on most computer cutters; product has a yellow 2 mil polyester film between adhesive and rubber to hold centers in place while transferring designs and to identify any residue remaining after sandblast; construction (other than liner) is the same as Intertape™/Anchor’s popular 123 machine stencil; use with IPG/Anchor Filler #223. Note: 15” can also be used on most computer cutters; 30” works only on cutters with a standard 1⁄2” on center sprocket system. 129YEE Designed for use on most computer cutters; this product has a clear 3 mil polyester film liner; product has a yellow 2 mil polyester film between adhesive and rubber to hold centers in place while transferring designs and to identify any residue remaining after sandblast; construction (other than liner) is the same as IPG/Anchor’s popular 123 machine stencil. EE = Extended Edge; rubber extends to the edge of the material to prevent slipping and for smoother tracking through high speed cutters. 154 Same construction as 123 computer stencil; blue liner and 2 mil polyester film between outside adhesive and rubber; holes are IBM® configuration (1⁄2” from center of hole to center of next hole); compatible with most computerized cutting machine with sprockets matching this alignment; use with IPG/Anchor Filler #223. Note: Style 154 will not work on large pin computerized cutters. 154Y Yellow; 2 mil polyester film between outside adhesive and rubber to help identify residue remaining on substrate after sandblast; use with IPG/Anchor #223. Click to request a quote for your type and size.